We are a leading Manufacturer of motor gears from New Delhi, India. We make gears for dc micro motors. These are generally made as per Customer design . 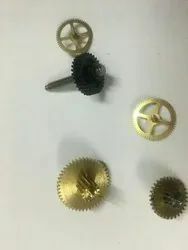 The mptor gears are made in ferrous and nin ferrous materials. Swadeshi makes soundless Gears for maintainence free applications . We take special care in maintaining the tooth to tooth errors and pcd errors in control . The MOT is controlled to 0.05 mm maximum tolerance .